If you're considering a new roof for your home or outbuilding and are looking to stick to a tight budget, roll roofing may be a good choice. Though it doesn't have the life expectancy of traditional roofing shingles, roll roofing is a budget-friendly option that's acceptable for many low-slope roofs. Since it's also fairly simple to install, roll roofing is popular for buildings like sheds and barns. Roll roofing is a lightweight, comparatively inexpensive roofing material that's sold in a large roll. It differs from other types of roofing, which typically come as shingles, in that it is one piece of material. Generally, this product is sold in rolls that are 36 inches wide and contain 100 square feet of material. Industry professionals often refer to the roll of roofing as a "square." Each roll weighs about 75 pounds. Roll roofing has a bumpy surface, like other traditional materials, thanks to its small rock-granule composition. It's usually an asphalt-based product. In other instances, roll roofing is composed of a mineral surface with UV protection, or a fiberglass surface with the same UV protection, and an asphalt base. The purpose of the UV coating is to protect against the sun's rays, weathering and other physical damage. Roll roofing generally has a life expectancy of anywhere from six to 10 years. While this is less than the average life of more traditional roofing materials, roll roofing is usually much less expensive to purchase. In some instances, it's used as a base material underneath traditional shingles in commercial construction. Roll roofing is attached to the substructure via a series of nails. Unfortunately, each nail location presents an opportunity for future leaks, making it a questionable choice for residences. To install roll roofing, you'll need to cut the material into long strips of the correct length for your roof and lay it flat. The strips should always be horizontal. 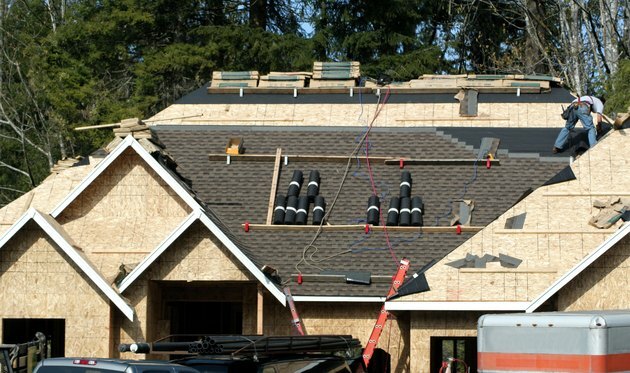 For extra durability, you may install roll roofing in two layers. It also helps if you first install a layer of roofing felt. If you choose not to install an extra layer, you'll install the material directly over the roof sheathing. This sheathing may or may not be primed for extra durability. Lay the first strip of material so that it overhangs the drip edges of your roof by about a quarter inch. Attach the strip to the roof every 3 inches with nails, pulling it tight as you go. Don't put nails any closer to the edge of the roof than 1 inch. Overlap the next strip of roofing material with the first by at least 4 inches. This will help to protect the subsurface. Continue to attach the material with nails every 3 inches. Use a 6-inch swath of roofing cement to attach the ends of your strips of roll roofing to the roof itself. For additional security, whenever you encounter a peak or valley, be sure to overlap the roll roofing. Since roll roofing is very light and thin, but not particularly durable, it's a great option for installing over an existing roof. You should not install it over a roof that's severely damaged, however. Even small cracks in the existing roof can jeopardize the integrity of the layer of roll roofing. Before you begin, thoroughly clean the existing roof, removing any debris like leaves or sticks. Then, install a layer of roofing felt to provide a sturdy base for the new roll roofing. Once this has been done, the roll roofing can be installed in the same manner as if it were over bare roof sheathing. How Thick Is Roofing Felt?